Thanks for posting, Small Dollar! I'll probably have more to add later, but for now, here are some links I was collecting on this episode (spoilers abound). We got a new song, Time Adventure, by Rebecca Sugar. I'm not crying, you're crying. Instead of the normal outro, we also got an extended version of Come Along With Me that shows tantalizing glimpses of the fates of many of the inhabitants of Ooo and the multiverse. And of course there's one very special kiss. No wait, the other one. No wait, the other other one. Need a refresher to help understand the finale? Here's a lore recap, and here's a timeline explanation. I suppose I should get around to watching all of Adventure Time now. I love that the creators got to speak through BMO and save the world through art. I'll be singing "Time Adventure" every time I feel nostalgic for the rest of my life. Adventure Time was a bright spot in a very dark time in my life and while I lost track of it after a while, I will still always love it. I watched this, even though I wasn't remotely caught up and I cried a lot. It just felt so right. My reaction was basically "thank you." It felt like saying good-bye to a friend, but also not really a good-bye. We all grow and change and that's what time is about -- change. What a wonderful journey. I look forward to re-experiencing all of it again one day. This was so beautiful and perfect and necessary and needed. Ugh. Their mind. I love Adventure Time so much. I'm watching this explainer and it shows in the ending montage that Simon goes on a quest to get Betty back out of Golb. Oh my goodddddd. It also made me think about how the thing about the Crown is that in its corrupted state, all the crown does is produce Fanfic about the fanfic of the original Ice elemental. Gunter turns into fanfic of Evergreen, Simon turns into fanfic about Gunter, and Gunter 2 turns into fanfic of the Ice King. Who is in love with his own fanfic. And then the Ice Thing performs fanfic for Marcy& Bonny. I love this so much. I disagree with the video's assertion that Beth is a reincarnation of Jake, I think it's more likely that she's a descendant of Jake & Lady Rainicorn. I would really like to take all of the "lore" episodes and cut them into one movie with no interruptions. 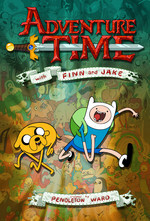 I like Adventure Time, but this finale felt like it was about all of the denizens of Ooo except for Finn and Jake. Like, these two are our protagonists, could they get a bit of an arc or something? Time Adventure may be the best song ever written about friendship and I can only get about 30 seconds into it before tears stream down my face. This show has been a journey! I remember first seeing the pilot/teaser episode, and then much later hearing the very first speculation about the world being post-apocalypse, when people were first pointing out old fridges etc. on the periphery of scenes. I'm a sucker for hidden stories that make you dig and discover, so that's when I really got interested. I've heard that those things were originally inserted as a joke, but then the crew decided to run with it and boy did they. The last episode seemed really indulgent, the "end of Ooo" clearly much more about the end of the series itself. It read as a lot of things: a love letter both to and from the crew, a goodbye, a thank-you, a comfort that even if it's over we'll always have the experience. It touched on a lot of the show's major themes, as well as the theme of nostalgia - I mean, this show ran for a *long* time, a lot of people who watched it in their teens and childhoods are adults now. I loved it. I actually wish more shows would take this approach, I feel like I have more closure this way. What a show. I'm thankful to Adventure Time; not only does it stand on its own, I think it inspired a lot of other great art and shows too. Finally watched it. Just bawling. Absolutely crying like a baby. It was when Fern asked Finn to plant him at the treehouse that finally did it.